Below you fill find all funeral homes and cemeteries in or near Galloway. Popular neighborhoods in Galloway include: Germania, Absecon Highlands, Conovertown, Leeds Point, Oceanville, Pomona, Smithville, Atlantic County, and Cologne. Suburbs of Galloway: Galloway Township, Smithville, Absecon City, Absecon Heights, Absecon Highlands, Pinehurst. 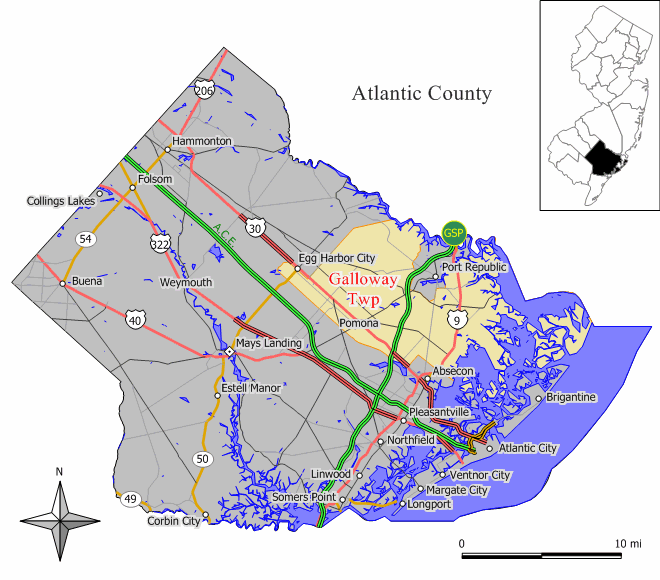 Galloway is also known as: Galloway Township, and New Jersey. Their current mayor is Mayor Anthony Coppola, Jr..
Zip codes in the city: 08201, 08205.
ounty funeral flowers can be purchased from one of the local funeral shops we partner with. Some of the notable people born here have been: Austin Johnson (american football player). Galloway Township is a township in Atlantic County, New Jersey, United States. At 115.2 square miles (298 km2) of total area, Galloway Township is the largest municipality in the State of New Jersey. As of the 2010 United States Census, the township's population was 37,349, reflecting an increase of 6,140 (+19.7%) from the 31,209 counted in the 2000 Census, which had in turn increased by 7,879 (+33.8%) from the 23,330 counted in the 1990 Census; The increase of more than 14,000 in population since the 1990 Census was the 11th-highest in the state.Galloway Township was incorporated by Royal charter on April 4, 1774, from portions of Egg Harbor Township, when it was still part of Gloucester County. Galloway was incorporated as one of the initial group of 104 townships by an Act of the New Jersey Legislature on February 21, 1798. After becoming part of the newly formed Atlantic County in 1837, portions of the township were taken to create Mullica Township (March 13, 1838), Egg Harbor City (June 14, 1858), Absecon town (February 29, 1872), Brigantine Beach borough (now Brigantine city; June 14, 1890) and Port Republic (March 1, 1905). It was disclosed by The Daily Journal on October 16th, 2018 that Frances "June" Corbo (Cook) perished in Galloway, New Jersey. Ms. Corbo was 87 years old and was born in Saginaw, MI. Send flowers to express your sorrow and honor Frances "June"'s life. It was disclosed by The Daily Journal on December 2nd, 2017 that Mary Louise Ballard (Downs) perished in Galloway, New Jersey. Ms. Ballard was 90 years old and was born in Chicago, IL. Send flowers to share your condolences and honor Mary Louise's life. It was noted by The Daily Journal on September 21st, 2016 that Steven K Ray perished in Galloway, New Jersey. Ray was 45 years old. Send flowers to express your sympathy and honor Steven K's life. It was reported by The Daily Journal on December 21st, 2015 that Rose Steinberg (Ludanski) passed away in Galloway, New Jersey. Ms. Steinberg was 105 years old and was born in Michaliski, . Send flowers to express your sympathy and honor Rose's life. It was disclosed by The Daily Journal on November 17th, 2015 that Joseph Anthony DDS Corbo died in Galloway, New Jersey. Corbo was 84 years old. Send flowers to share your condolences and honor Joseph Anthony DDS's life. It was written by The Daily Journal on June 30th, 2015 that Betty Jane Gaskell (Anderson) passed away in Galloway, New Jersey. Ms. Gaskell was 85 years old. Send flowers to share your condolences and honor Betty Jane's life. It was noted on September 22nd, 2014 that Lucy Lapan (Talcott) perished in Galloway, New Jersey. Ms. Lapan was 81 years old and was born in Burlington, VT. Send flowers to express your sorrow and honor Lucy's life. It was revealed by The Daily Journal on July 17th, 2014 that Mary Ross passed on in Galloway, New Jersey. Ross was 96 years old. Send flowers to share your condolences and honor Mary's life. It was revealed by The Daily Journal on February 11th, 2014 that Virginia S "Ginnie" Hughey (Sacca) passed away in Galloway, New Jersey. Ms. Hughey was 93 years old and was born in Paoli, PA. Send flowers to express your sympathy and honor Virginia S "Ginnie"'s life. It was revealed by The Daily Journal on December 10th, 2013 that June E Defrates perished in Galloway, New Jersey. Defrates was 87 years old. Send flowers to share your condolences and honor June E's life. Wimberg, Lloyd - Wimberg Funeral Home, Galloway, NJ : Reviews and maps - Yahoo! Local, 609.748.7070. Get Ratings, Reviews, Photos and more on Yahoo! Local. Wimberg Funeral Home, Galloway, NJ : Reviews and maps - Yahoo! Local, 609.748.7070. Get Ratings, Reviews, Photos and more on Yahoo! Local. We work with local florists and flower shops to offer same day delivery. You will find budget sympathy flowers in Galloway here. Our funeral flowers are cheap in price but not in value.